My 12 year old daughter started middle school this year, she is growing up fast! She requested a few changes to her room so I’m in the process of updating a few decorative accents like her curtains and bedding. The main switcheroo was replacing her old dresser, and since I adore campaign furniture I thought Ave Home’s Harper Campaign Dresser was the perfect piece for the update. My girl loves turquoise blue so that was the color I painted it for her, it’s a stylish new look for one corner of her room. The piece arrived in white, lovely as is but my girl wanted some color and Chalk Paint is a quick way to make it so. This was truly one of the easiest makeovers because there was no need to prime the dresser, I simply removed the hardware and layered on a few coats of Annie Sloan’s Chalk Paint in the color ‘Provence’. Since the piece is flat on all sides, I only needed to roll on three thin coats of paint with a foam roller, I allowed each to dry for a few hours in between and it was done in one day! To protect it, all it needed was a coat of clear wax, I applied it with a clean cotton rag. After the wax, all I had to do was reattach the hardware, I so love this color with the brass campaign hardware. Thanks so much to Ave Raw for sending this dresser my way, it’s absolutely perfect, and such high quality too. My daughter will love this piece for years to come. Note that very soon Ave Home is changing their online delivery options. You can place an online order today through August 31st but starting September 1st, AVE Home pieces will then only be available through dealers. However you can also contact Ave Home for a special order if there is no dealer near you. *This project concludes Part Three of a sponsored partnership with the Ave Raw collection by Ave Home. See also my projects featuring the Colette Desk and the Audrey Butler Tray. All opinions are my own. Looks fabulous! Just curious to know how the inside portion of the drawers turned out? Was there paint bleeding through? Did you tape the inside at all and just to the inner lip that sits flat blue as well or did you leave it white? Hope my question isn’t confusing and you get what I mean! 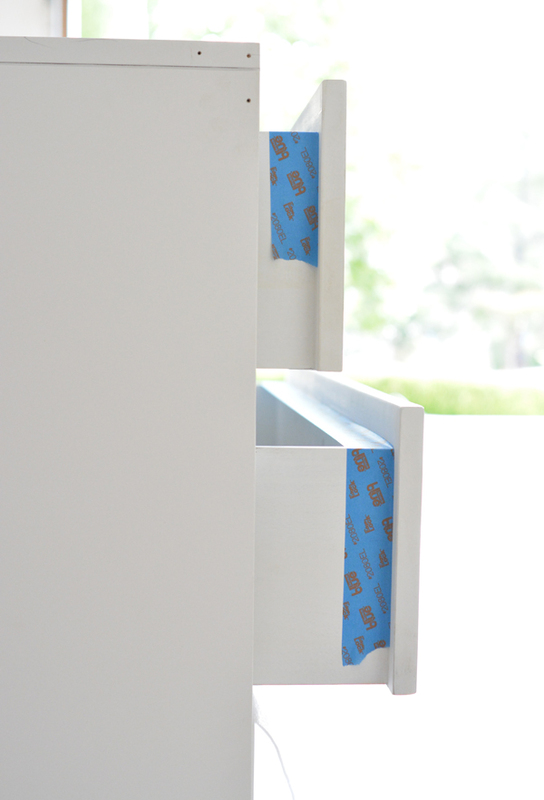 Hi Maria, the inside drawers were white, but even if they were raw, I follow this technique, I tape off the inside (see this picture: http://centsationalgirl.com/wp-content/uploads/2016/08/tape-inside.jpg) and then paint only the top and sides of the drawer front, not the actual sides of the drawer that slide in. Adorable room! Wall paint color please? Is there a link to the entire room? Thanks! I’ve followed you for years and 3 years ago, I used your every step to refinish some awful knotty pine furniture and customized it with painted art work. It is beautiful. BUT…I used a wax to finish it off, and now it is turning yellow. Have you had that experience and is there a wax you recommend? What about spray polyurethane? That is gorgeous! I will definitely be trying to implement a gorgeous piece like that in my new place when i move in a few months. The turquoise dresser is really beautiful Kate! Turquoise and gold is one of my favorite combinations. Your daughters room is really cute and I bet she loves it. I spy one of your fun fabric designs on her duvet! I hope her school year is off to a great start. Turquois is a great color for a dresser because it truly stands out. However, in the right room, it can really make a statement. It’s especially stunning in a room that has a lot of white. I love this! And not just because I have a dresser painted in Provence in my house already. I have a campaign nightstand that I need to paint sitting in my garage and I have been reluctant to use chalk paint because I thought the more matte finish wouldn’t work well with the style. I thought it needed more gloss (like your green desk). But at the same time, chalk paint is so easy to work with, I didn’t really want to deviate from what I’m now comfortable with. But this is beautiful. So do you recommend using Annie Sloan on a campaign piece? I’m curious why you didn’t need to prime the dresser first. Was it because of the chalk paint? CAN I USE CHALK PAINT TO PAINT THE BUFFET IN MY DINING ROOM? ; I WANT TO CHANGE THE COLOR TO WHITE. CAN I USE POLYURETHANE?